Continuing with my familyâ€™s attempt to create a frugal yet festive holiday, over the Thanksgiving weekend we decided to make something from scratch. My wife has a collection of old cookbooks, so pulling a Betty Crocker book circa the early 1970s from the shelf, I flipped through the sticky, crumpled pages and found the â€˜All-time Favoritesâ€™ candy section. Hmmâ€¦ what sounds good: Fondant-stuffed dates? Spicy sugared nuts? Ting-a-lings? We voted for lollipops. With only six ingredients (including the stick) what could go wrong? Well, plenty, especially if you happen to like your pots and pans. Letâ€™s just say, that the goo used to make lollipops gets scalding hot fast. Donâ€™t be tempted to dip your finger into it to scoop out a bite. You wonâ€™t like it. (Trust me.) And another fun fact about lollipop goo: It cools down, and gets rock solid, even faster than it becomes scalding hot. This should be obvious, I know. But for me, this whole lollipop-making thing was a learning experience. Before I knew it, the bottom of my favorite cooking pan was covered in an impossible-to-chip-away mass of bright blue crust. My knife couldnâ€™t even make a dent. My only option was to reheat the stuff and turn it back into liquid, which I did. Then I found myself running around with a pan filled with boiling blue liquid that had nowhere to go. I didnâ€™t dare pour it down our kitchen sink. Our old pipes drain slowly enough without adding crystallized lollipop broth to them. In the garbage can? I could picture the lollipop liquid burning through the plastic can as fast as I could pour it. Finally, I gave up and poured the whole mixture into a cup. Yes, that poor cup has now found its way to a landfill. Not very environmentally friendly, I know. Now I know how mad scientists feel when theyâ€™re trying to get rid of their nuclear waste. Anyway, donâ€™t let my experience deter you. Sure, the resulting lollipops didnâ€™t quite come out round. And, yes, my 9-year-old son and his cousin spent the next hour after our experiment complaining that they couldnâ€™t get lollipop residue to stop sticking to their teeth. Ignore all that. Hereâ€™s the recipe. Try it for yourself. Just keep a burn kit handy. A lead-lined drum might be smart, too, for the leftover goop. Lightly butter a cookie sheet and arrange sticks on sheet about 4 inches apart. Combine butter, corn syrup and sugar in a medium-sized saucepan. Heat to boiling over medium-high heat, stirring occasionally. Reduce heat to medium. Continue cooking, stirring frequently (really, really frequently), to 270 degrees on a candy thermometer. Stir in food coloring. Drop mixture by tablespoonfuls over end of each stick. 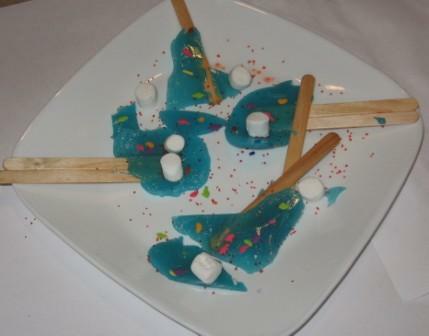 While still warm, press candy sprinkles, marshmallows, etc onto lollipops. Let cool before removing from baking sheet. We made a double batch and colored one blue (shown) and one red (eaten, grudgingly by two 9-year-olds). LOL I’m sorry, but the story of your adventure with the pot of boiling sugar was priceless! Don’t give up on lollipops. After you’ve finished making them, fill the pan with warm water and let it soak. The hard candy left will dissolve overnight and can be safely washed down the drain. I hope your finger feels better soon. And, be sure to try your hand at peanut brittle. If you can do lollipops, peanut brittle will be a snap! Like Sandy said, it’s really just sugar in the bottom of the pan, so soaking it should do the trick. When I started working at NCA I decided that I needed to know how candy was made so I went to a candy-making supply store and went to work with some ingredients and molds. I found it very educational, but there was something not quite right about what I made. Maybe I should try again, but after doing this a few times, I decided to let the pros do the bulk of it for me! The only really cool thing about making candy at home is that it makes good gifts. Other than that, it’s cooking at monstrously high temperatures and getting things perfect, which is not really part of my skill set. I look forward to what you make next! That was hilarious! I wish I’d been there to witness your “adventure” first hand. You should trying making caramel tomorrow. It’s easy. I promise. Caramel is NOT easy!! I ended up with a molten black ball of hell in my trash barrel. I applaud your bravery. Thank you so much for sharing and giving me a good giggle. It reminds me of the time I convinced one of my parents to let me melt crayons in a pot. That pot will be glad to keep your cup company at the landfill. I love to make lollipops!!! I make them at least once a month. NEVER EVER stir sugar it will take care of itself. put the stuff in the pot med high heat, stir to combine and let it take care of itself! when it gets to hard ball stage dump it by spoonfulls over your sticks or dump it on a sheet lined with tin foil and when it cools break it apart. It really is easier then it seemed if you try it again!